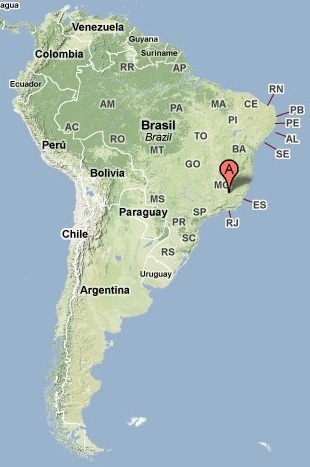 From our hometown Uberlândia I flew to Belo Horizonte (BH), capital of our state, Minas Gerais. I drove four hours or so from the BH airport to the park. The crappy rental car combined with the Monday morning traffic didn’t add up to a pleasurable drive. But once I was out of the city, I was able to relax a bit more and take in the scenery. There’s a single entrance that leads into the park. Once there, it’s just a short winding drive up into the heart of the reserve and to the only lodgings within it. My hope was to stay at Caraça’s Sanctuary. I was winging it, because I had been unable to reach anyone to make a reservation. My fallback plan was to find lodging in one of the nearby towns. Luckily, I had no trouble getting a room for the week once I got there. Turns out the phones had been down. I purposely arrived on a Monday and left on a Friday so as to avoid any weekend crowds from BH. During my stay, I saw tour buses arriving for day visits. It never really felt crowded and there generally weren’t many overnight guests. Meals are included with the lodging and are delicious regional fare. The resort offers three main attractions. First, it’s a religious destination for Catholics. 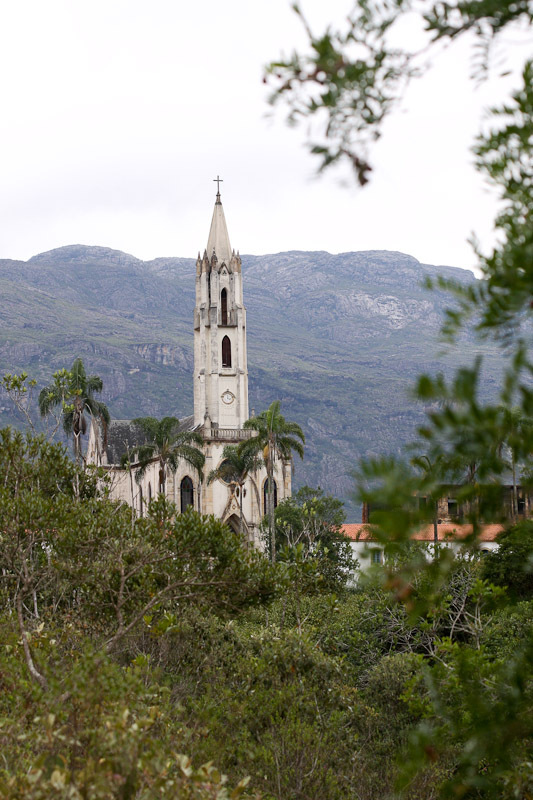 There’s a neo-gothic church, the first in Brazil, that holds Mass nightly. I attended one Mass just for the experience. Second, having been founded in 1774, the area has historical significance. Dom Pedro II, emperor from the time when Brazil was an empire, spent time here. The buildings were once used to run a boy’s school. Famous alumni include a couple of Brazilian presidents. There’s a library of historical documents and the museum showcases historical artifacts. Third, and what attracted me, is ecotourism. The visitor’s center and local museum both demonstrate the environmental significance of the area. 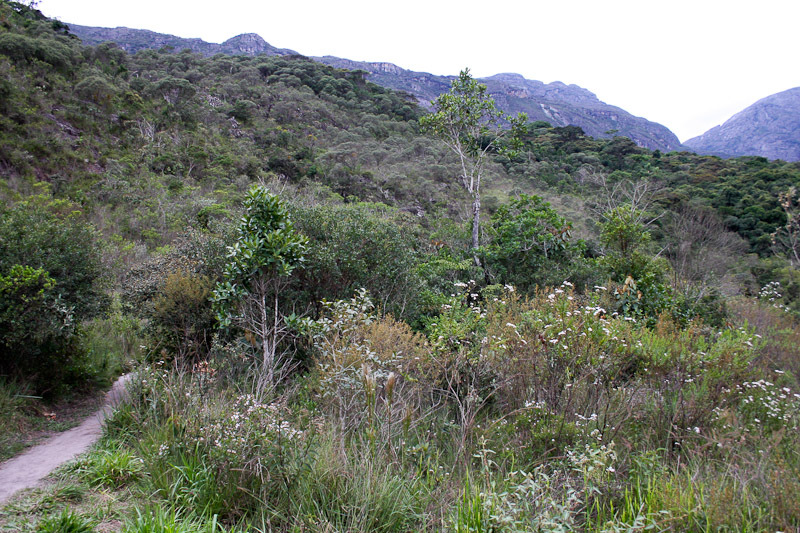 The sanctuary also hosts researchers studying various species within the reserve. 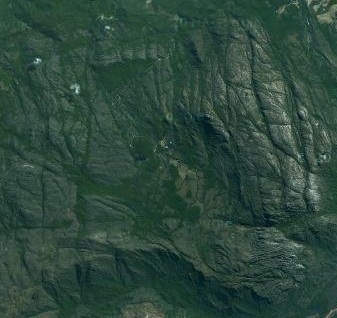 The area is surrounded by Caraça’s mountain range (Serra do Caraça). 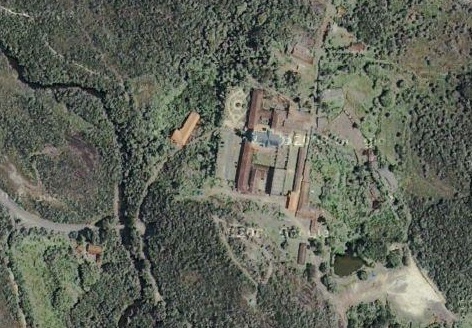 The sanctuary itself is located at the center of the satellite image below. The road comes in from the North and is the only way in or out other than hiking over the mountains. The sanctuary is located at latitude -20.097508, longitude -43.488286. Altitude varies widely throughout the park. The entrance is around 800m (2625ft) and the highest peak is 2072m (6798ft). I mostly kept close to the elevation of the sanctuary, around 1300m (4265ft). The park covers 11,233 hectares (43 square miles). 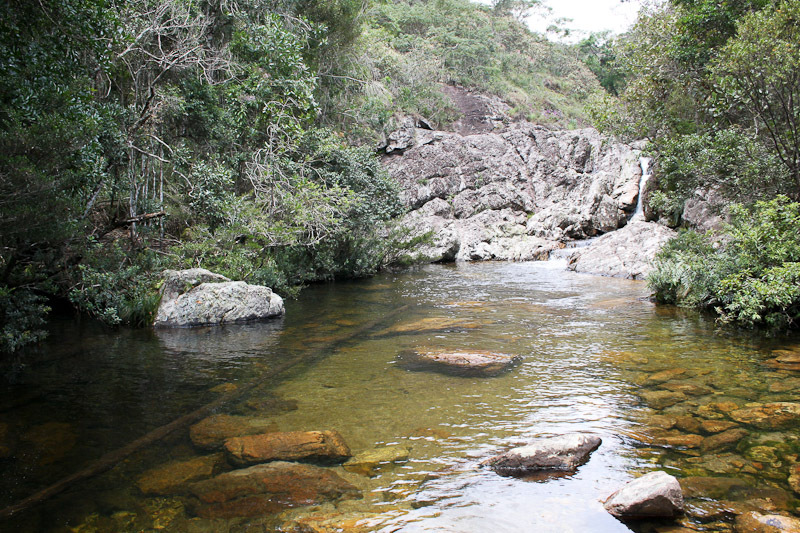 Ecologically, the park comprises a transition zone between Atlantic forest and savanna with grasslands at the peaks. We have plenty of savanna in our hometown region, so I was more interested in the Atlantic forest. 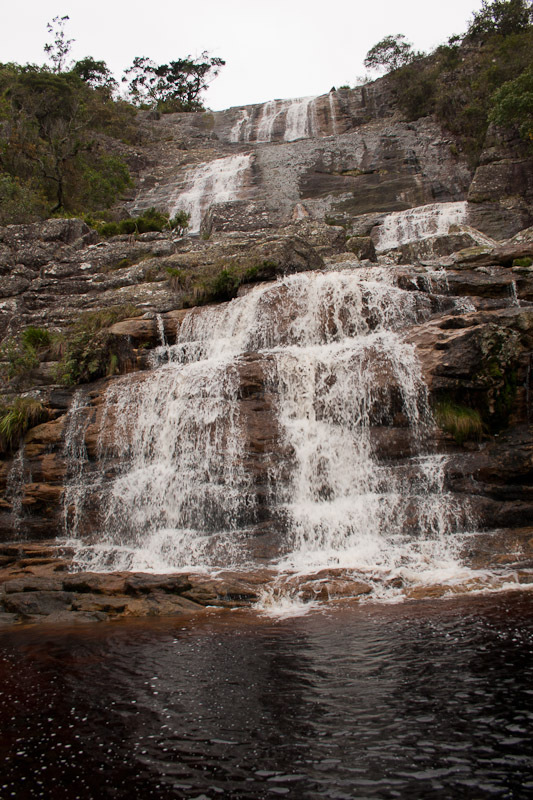 There are trails from the sanctuary that lead to various rivers, lakes, waterfalls, caves and peaks. The longer more difficult trails, which I avoided, require a guide. The Portuguese word “caraça” means “big face”. 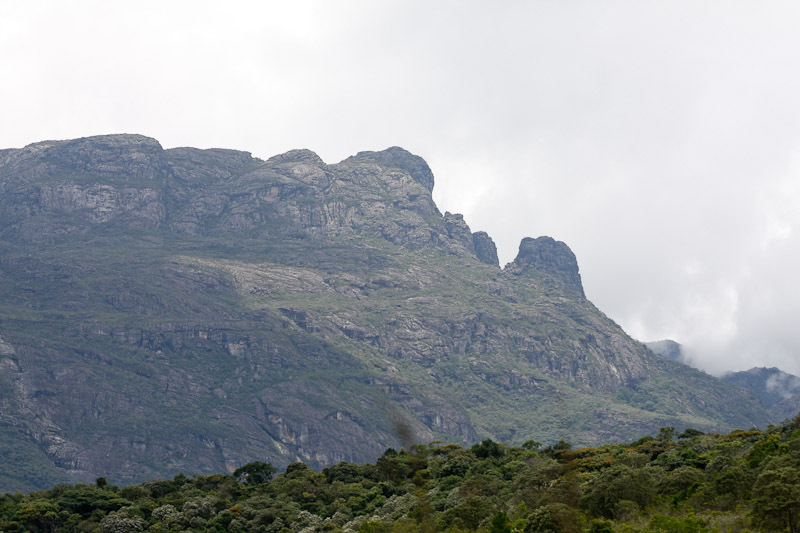 That name was given to the region because of mountain formations that look like the profile of a face in repose. 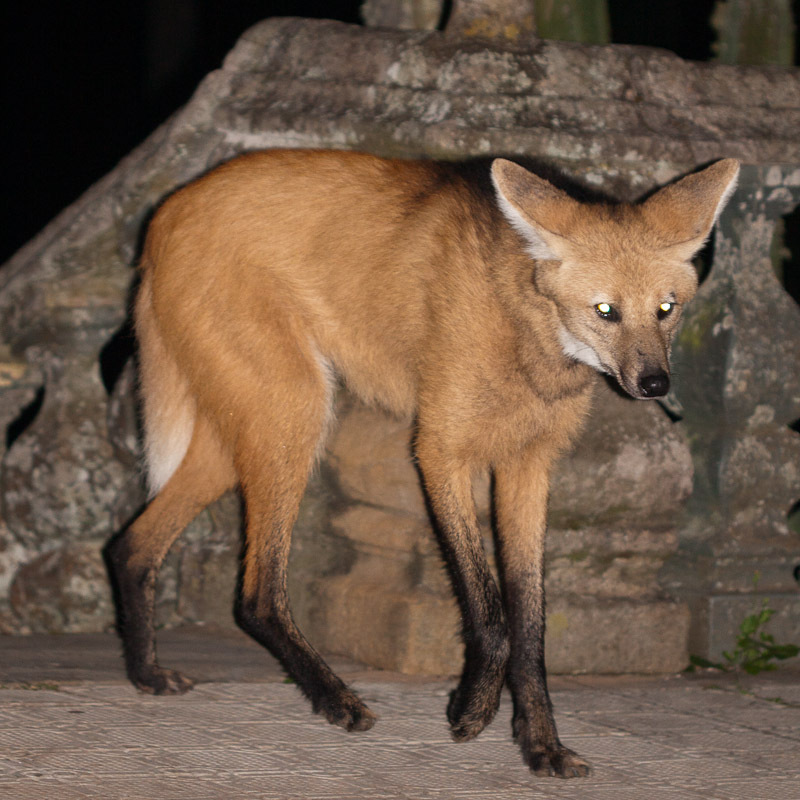 Every night the sanctuary priests put out food for a local canid, the Maned Wolf. They wolves come up on a patio where guests are seated, allowing for close viewing. I have to admit I was surprised by its size. I imagined it would be more fox-like. It actually reminds me more of a hyena. One night on the church patio, while there was a maned wolf feeding, a large tarantula crept across the patio. I could see the distressed look on people’s faces as it approached, not knowing whether to get up and potentially scare off the wolf or brave the spider. I was impressed that they remained seated. My own dilemma was whether or not to stop photographing the wolf and go photograph the spider. I ventured out onto the trails every night I was there. At one point I was surprised to see my headlamp reflecting off the eyes of a maned wolf in the distance. As I mentioned, they are bigger than I imagined, and I was slightly concerned. I asked around the next day though, and it’s unheard of for the wolves to attack people. The maned wolf might be the star attraction, but there’s no shortage of other interesting creatures. A brochure I picked up at the visitor’s center says there are around 320 species of birds and 70 species of mammals in the preserve. The brochure lists the following mammals: Atlantic forest squirrel, Brazilian tapir, collared peccary, Moojen’s Atlantic Spiny-rat, paca, red brocket deer, ocelot, puma, jaguarundi, black-fronted titi monkey, Geoffroy’s marmoset and the giant anteater. Of the above, I only saw the squirrel and several troops of monkeys. Some of the other things I saw while there include a few large monitor lizards and a variety of frogs. I saw and heard countless birds. A large approachable bird, the dusky-legged guan, was often in the sanctuary garden. As for the invertebrates, I’ll be posting photos of those in the near future.